An Immaterial Survey of Our Peers is a group show currently on display at the School of the Art Institute of Chicago. Curated by Web collective JOGGING, the exhibit brings together the work of a group of artists whose art is primarily displayed and distributed via the Web. Given the immaterial quality of much of the work, the show does not physically take place within the gallery space itself. 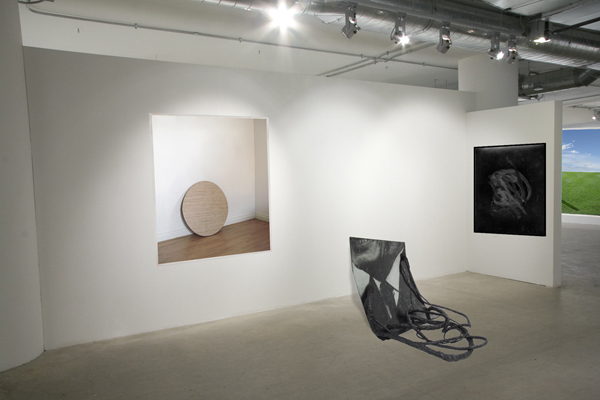 Instead, the artwork has been collected and arranged over photos of the empty gallery space using digital compositing techniques. These photos are then displayed as documentation of the exhibit on the show website, and projected onto the walls of the gallery space for the show's duration. Artists on display include AIDS-3D, Kari Altmann, Jon Rafman, Travess Smalley, Ben Schumacher, and Hermonie Only, among many others. The show is currently on display both online and at the Sullivan Galleries at the School of the Art Institute of Chicago.